Intechtel is a trusted telecommunications contractor and source for data cabling projects in the Inland Northwest. We provide local service to businesses of all sizes across the region, always with the same results. Superior service, quality workmanship, and dedicated support. Your technology and network wiring projects are a critical element to your organization and we understand that. This is why we guarantee all of our work and warranty our cable installations for LIFE. Whether you need a single cable or an entire store cabled, Intechtel can help. SAME and NEXT DAY on-site service available in Coeur d’Alene, Post Falls, Hayden, Spokane, Wa and surrounding areas. 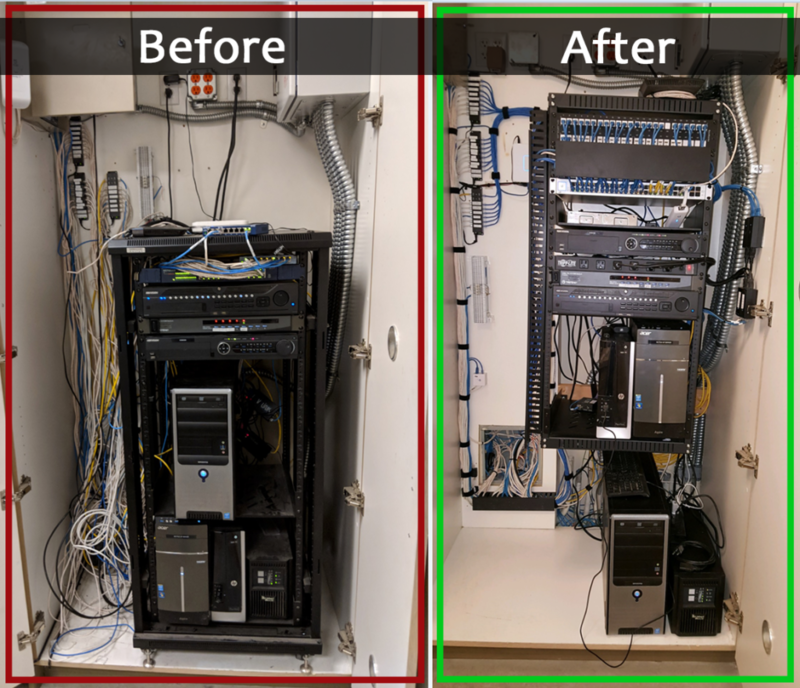 Maybe your data room or network closet looks like mess of blue spaghetti? This can make it difficult to track down issues, make changes to your network and have a huge impact on the performance of your Internet and network. Over the years a cable here and a cable there adds up. Let Intechtel reorganize the mess and create a space you can be proud of! Recent data cabling project by Intechtel. To speak with a data cabling or technology deployment expert! Whether you are cabling for a new building, adding additional network drops, or doing a remodel where your data cabling will be exposed, it is important to plan and budget for the right cabling upfront. Not to meet the needs of today, but to meet your needs well into the future. 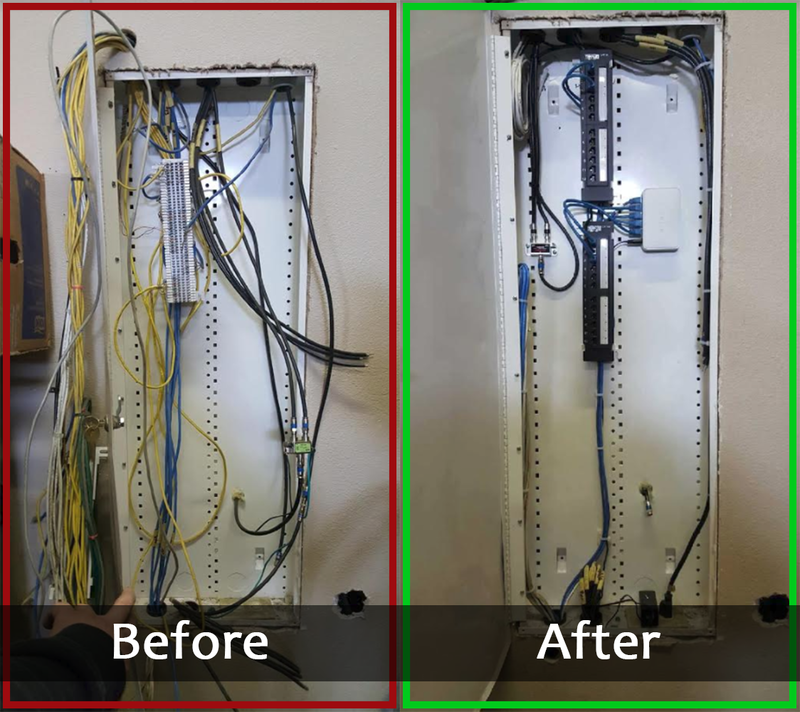 Cat5e is very much the standard in network data cabling even in 2018. A tenfold improvement over Cat5, It offers data transfer rates of up to 1000 megabits per second (or 1 Gigabit per second) at up to 328 feet due to the tighter twisting of each additional pair of wires contained within the jacket which helps to attenuate crosstalk. Cat5e is well understood, easy to work with, and affordable. 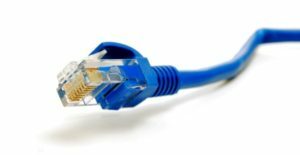 For most small business applications Cat5e cable will suffice, but as the demands of our data consumption and usage continue to grow at an exponential rate, this may not always be the case. Cat6 is the gold standard in data network cable today. Improving further upon the design of Cat5e, Cat6 allows for data transfer rates of up to 10 Gigabits per second at up to approximately 180 feet. 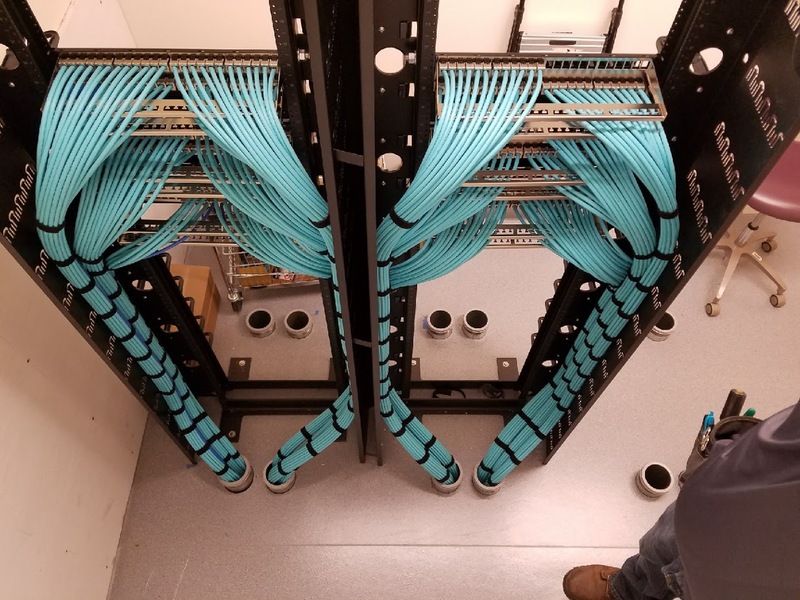 These speeds are achieved by even more twists per inch per pair than Cat5e, and the addition of a plastic crosstalk divider in the center of the jacket that separates each of the four pairs. Greater care must be taken during the installation and termination of Cat6 to ensure that the full potential of this cable can be achieved. The use of Cat6 data jacks and Cat6 patch panels is also necessary when using cat 6 if you want to be able to realize the cables full potential, but Cat6 is backwards compatible with Cat5e Jacks, ends, and patch panels. Cat6 cabling, jacks, patch panels, and ends are usually more expensive than Cat5e due to the higher quality materials and the more expensive manufacturing process needed to meet the Cat6 standard. That being said, if you project your data needs growing over time, investing in Cat6 upfront is a safe and wise bet. Still curious about the difference between these cabling standards, or want to talk about the cost difference for your upcoming project? Give us a call at 208-635-4400. The major difference between single mode and multimode optical fiber is that multimode has a significantly larger core diameter. Multimode is normally 50-100 micrometers, which is much larger than the wavelength of light running through the fiber optic. This gives multimode fiber optic cable greater capacity to carry light. Although multimode has a greater capacity, single mode has a higher fiber distance product limit. This is because multimode supports more than one propagation mode and therefore is limited by modal dispersion. Single mode is typically used over long distances, such as between cities or states, whereas multimode is primarily used for inside plant infrastructure. At Intechtel, we have the tools and experience to work with both types of fiber optic cabling for inside and outside plant installations and repair. Serving Spokane and Coeur d’Alene areas.